I had planned to do quite a lot last Thursday evening and you know what they say about best laid plans. Instead of cracking straight on with the shed I had to nip out to pick up a new laptop, which ordinarily would be a moment of celebration but too much is going on for me to enjoy this new bit of tech. It did allow me to pick up the correct sized wood for the door but the super cheap skirting board wasn't available to I could only kill two non-named, non-favorite, birds with one stone instead of three. So it was 7:30 by the time I got home which was a bit of a late start but I cracked on. 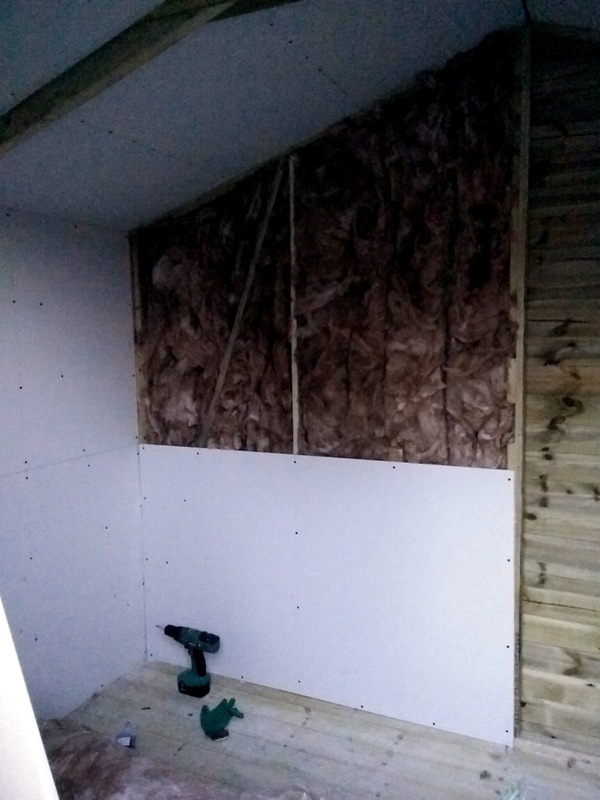 Did all the measurments on the two boards that will cver 90% of the left hand side of the back wall. Then it was the unpleasant insulation. I guestimated and cut the smaller left panel but my guessing was way off and I had to add lots of little strips and bits to fill out the cavity. It's not too bad actually but now I'm runnign out of staples as half of them don;t even go through the thickness of the earthwoll anyway, which is annoying. 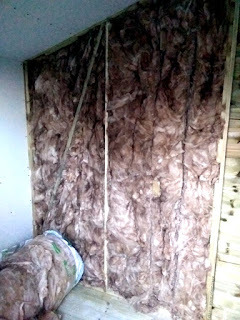 I opened up my third roll of Earthwool and split two-thirds off for the wider middle section. You can clearly see where the pre-cut perforations already exist so all I did was unwind the piece I need. It was also hand to wrap roudn tthe two little mid wall studds I added for extra support. 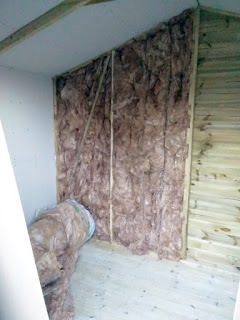 I also realised that I'd forgotten to put any extra wood at the top but I was luckily able to peel back the insulation and add two pieces to allow screws to be placed on the top panel and the Apex board wedges. I was really lucky with the bottom board as the insulation was not as flat as I would like and there was another real risk that the internal pressure would pop the screw holes again but it went on fine. I then trimmed the corner of the top piece so it could accommodate the bottom-left sloping edge. Light was fading at this stage so I didn't persevere. The board is ready to go, the fit isn't perfect there's a bit of a gap in the bottom left corner but it has to be that way or the right edge won't line up with the extra studwork. Far better to fill a gap than not have the board attached. But I'll get that piece up tomorrow and then decide if I continue on the back wall, which will be difficult as I've run out of longer screws to add the mid board studs, or try some of the front wall pieces. You are making massive progress Dave!